Illustration © The Estate of John David Roberts. Reproduced with the permission of the William Roberts Society. Text © David Cleall, from Christie's London, Modern British and Irish Art, 20 November 2013 (lot 7). The Bowling Alley is an important but little-known work by William Roberts dating from 19278. In the twenties Roberts achieved considerable critical acclaim and some commercial success while not compromising the challenging and experimental nature of his work. At a time when avant-garde activity in the visual arts in Britain had virtually disappeared, his aesthetic position didn't waver. Following a successful one-man show at the Chenil Gallery in 1923, he developed a very original and highly recognisable visual style that drew upon cubism, Vorticism and expressionism. There was little appetite among middle-class art buyers for this type of 'advanced' art at the time, but fortunately some richer patrons such as Edward Marsh, Samuel Courtauld, and Sir Michael Sadler supported Roberts through purchases for the Contemporary Art Society. Eight major paintings and a number of drawings were purchased by members of the CAS between 1923 and 1928, and these were subsequently gifted to regional galleries. Between 1925 and 1926 Roberts undertook a demanding commission from T. E. Lawrence to produce 27 pen-and-ink drawings (Houghton Library, Harvard University) to be used as tailpieces for the deluxe subscribers' edition of Seven Pillars of Wisdom. These drawings are both playful and dramatic, demonstrating a vigour that was carried over into the series of outstanding paintings that Roberts produced towards the end of the decade  including The Bowling Alley. Roberts had meticulously studied Lawrence's text in the preparation for his drawings, and the drawing Dogs of the Harith was worked up into a striking oil painting. He also turned to other literary texts, both classical and biblical, as source material for major paintings such as Susanna and the Elders, Deposition from the Cross (Tate), The Garden of Eden and Christ Driving the Money Changers from the Temple (Ferens Art Gallery, Hull). These works are characterised by a wry take on subjects familiar through their depiction by the 'old masters' and by Roberts's unique visual style. His seeking out and emphasising geometric forms through the simplification and exaggeration of especially cylindrical shapes has led to Roberts's figures being described as 'tubular' or 'tubist'  a term originally coined as a derogatory reference to Fernand Léger's idiosyncratic version of cubism. Unlike the cubists, Léger and Roberts applied their visual language to scenes of everyday life, although Roberts also had a greater interest in narrative subjects and less concern with the manufactured environment than Léger. 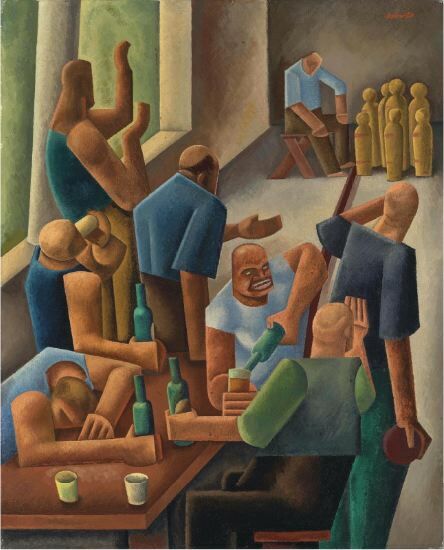 While Roberts's work is rightly characterised as quintessentially English, The Bowling Alley is an example of an often overlooked internationalism also present in his work. His time at the Slade coincided with the sensational 'Second Post-Impressionist Exhibition' of 1912, and he explained that he 'became an abstract painter through the influence of the French Cubists; this influence was further strengthened by a stay in France and Italy during the summer of 1913.' He saw active service in France during the First World War, and honeymooned in Paris a few years later. In the late twenties two further opportunity to travel abroad arose. A holiday in Provence provided the material for works such as Loading Ballast, Bullfight (Pallant House Gallery, Chichester) and French Peasants, and Roberts recalled that The Bowling Alley was one of three works 'inspired by a visit to Germany' . In August 1927 he travelled to Germany in a party led by the bookseller and publisher Charles Lahr and including the writers H. E. Bates and Rhys Davies. Lahr had published short stories by Bates and Davies in his magazine The New Coterie, for which Roberts had designed the cover and was also commissioned to provide portraits of some of the contributors. (His portrait of Bates was recently acquired by the National Portrait Gallery and that of Davies by the Rhys Davies Trust; Roberts's portrait of Lahr's wife, Esther, is in the Tate collection.) The group sailed from Gravesend to Rotterdam, and then travelled via Cologne and Mannheim to Lahr's birthplace in Wendelsheim. According to Davies, throughout the journey Roberts 'seldom stopped reading a pocket New Testament'. Roberts had no religious faith but may have been considering the Bible's narrative potential, given that one of the other works that had its origins in this German trip was The Prodigal Sets Out (study in Art Gallery of New South Wales). The group 'enjoyed a tumultuous welcome, and for the next few days the party was barely sober as the wine and beer flowed'. The third painting inspired by the German trip was The Rhine Boat, now in the Scottish National Gallery of Modern Art, Edinburgh. Whether Roberts was correct in recalling an association between The Bowling Alley and the German trip or whether it relates to the earlier French holiday, it does none-the-less share characteristics with his scenes of working-class Londoners at leisure, such as Love Song in a Bar (1922). While the physiognomy of the characters in both works is startling, in The Bowling Alley Roberts moves towards a more complex interest in the psychology of interpersonal communication. Though five of the figures in the composition are seen from behind, Roberts makes effective use of the merest hint of expression, the positioning of the head, the posture of the body and most emphatically the hand gestures. All concerned are sharing in a familiar and very recognisable social ritual. The Bowling Alley was one of Roberts's first works to be supported by the London Artists' Association, a scheme established in 1925 by four wealthy 'guarantors'  Maynard Keynes, Samuel Courtauld, Hindley Smith, and L. H. Myers  to support young and struggling artists. Roberts's work was starting to be exhibited internationally at this time. The Carnegie Institute, Pittsburgh, showed work by him in 1926 and 1929, and he was represented at the Venice Biennale in 1928, 1930 and 1932. William Roberts ARA: Retrospective Exhibition (London: Arts Council, 1965), p. 14 (no. 33). Rhys Davies, Print of a Hare's Foot: An Autobiographical Beginning (London: Heinemann, 1969), p. 171.